Price and I recently had a party at our place for my birthday. It was centered around a Mexican theme so I’ll be posting a few recipes from that that works well for a fiesta or just a great gathering. Enjoy! 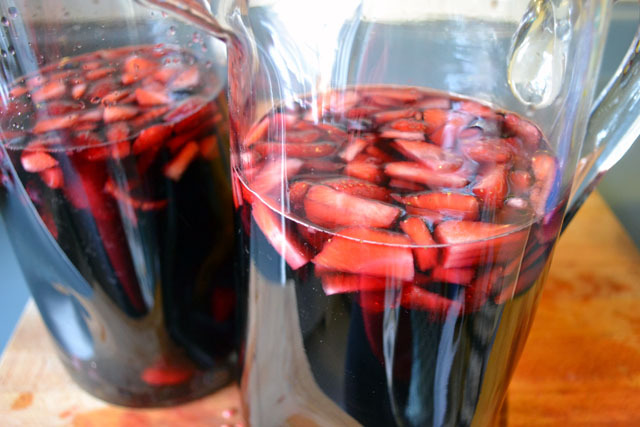 I love sangria so much because it works well year round and with so many different add in’s. You can do citrus, stone fruit, or berries, or an combination in between. I really prefer wine sangria but I have been enjoying red sangria more and more. Most of all I love to serve sangria when people are over. It works well for a crowd since you start with inexpensive wine, add fun fruit to it and it really transforms into a great drink. 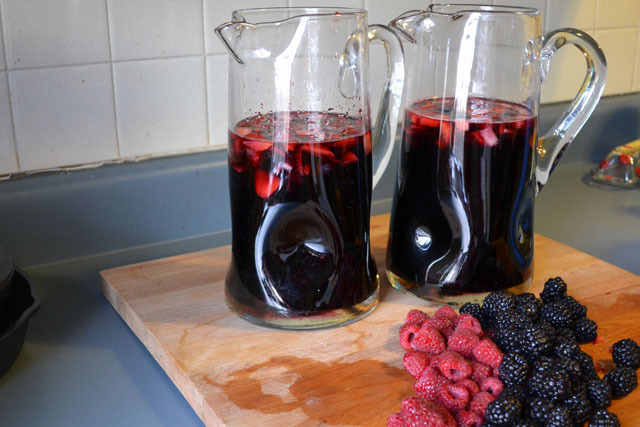 This red sangria is packed with fruity flavor. 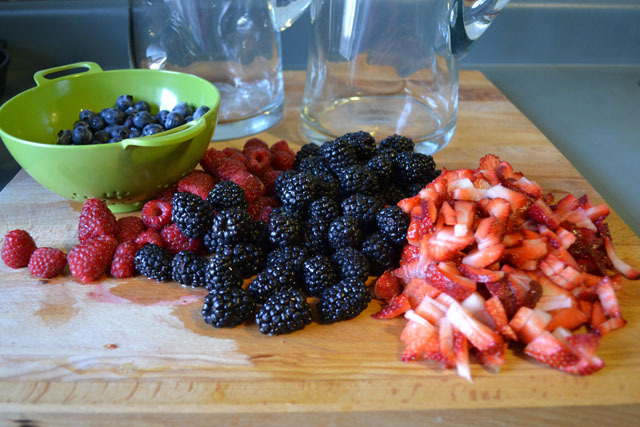 All of the different types of berries add so much sweet, bright flavor. 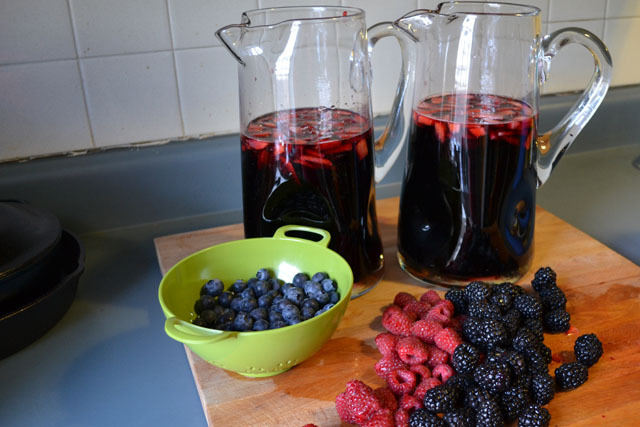 Each of the 4 different types of berries provides a different flavor to the sangria. Then when you add the tequila you get a bit of a kick to it in the end. The seltzer adds a nice bubble to the the whole thing to finish it off. Divide the 4 bottles of wine into 2-3 pitchers, depending on the size of pitcher. Fill the pitcher about half way full. Wash all the fruit. Discard an bruised fruit. Add all the fruit to the wine, divide evenly. Add the agave and tequila. Gently mix the wine to incorporate. Let chill for at least 2 hours before serving. Right before serving add the seltzer to the pitchers. I don’t love red sangria either but I bet this is amazing with all that fruit. I didn’t know sangria had tequila. I thought it was just wine? I’ve never had it either way but it is always intriguing to me. I bet the fruit tastes fantastic soaked in the various liquids. Looks great! I’ll be trying this for our superbowl party!